The book goes on sale next week, and you can read more about it here. I'm particularly excited to see contributions from Sergio Aragones, Richard Corban, Guy Davis, Michael Golden, Matt Groening, Tom Mandrake, Mike Mignola, Jerry Ordway, and Matt Wagner. 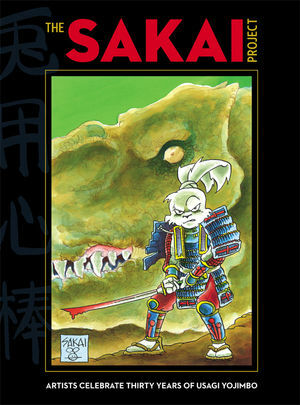 And I'm also excited for this volume because Stan Sakai is truly one of the nicest people in comics and has suffered immense hardship in his life over the past year, both with the unexpected death of his toddler grandson and now the failing health of his wife, Sharon, to a brain tumor. Paying the bills shouldn't have to be another problem on his plate, especially when he's spent a lifetime working hard to keep us entertained. That's an amazing list. I really hope it helps out. It's hard to see (much more to be, I'm sure) these folks who've thrown their whole lives into comics, all their passion, all their time and energy, and there's still no real safety net that late in the game. I was telling Duy, Mr. The Cube, the other day how happy it made me to find out that after all the damage Hitoshi Okuda did to himself making comics, his publisher and the burgeoning union structures have actually taken full care of him and his family. He spent years mostly for corporate properties, doing things like writing, drawing, and shading his own work so his paid assistants could make their own personal comics on the side, notoriously sending out hand drawn get well or thank you cards all the time to everyone in the industry, and being an uncredited cheerleader and extra set of hands when someone needed, until his own hands more or less gave up the ghost and he had to stop. But, unlike most comics situations around the world, it paid off with support. But, I can't look at the contributor's list up there, without thinking, all those guys are going to bat for one of their own, they're getting each others' backs, and that's fantastic. I'll be getting this for sure, I donated to him previously but I think I'm going to need to do so again. Stan actually has really good health insurance, but he made the decision to care for his wife in his own home, and that's where all the uncovered expenses came in. The way he's chosen to be there for her, day and night, moment by moment, has been incredibly touching to me. That's good to know, and really admirable. Hits close to home, really.